*1:1 Scale Sideshow Iron Man Light-Up Bust prototype!! *Thanos Marvel Bowen Designs Statue!! *Set of DC Wayne Casino Chips w/$100 Chip!! *CGC Graded & Autographed comics!! & many more awesome prizes!! 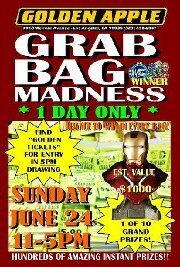 Drawing at 5pm for Golden Ticket holders. Buy as many as you want...until they sell out!!! LAS VEGAS — KÀ by Cirque du Soleil, the spectacular production at MGM Grand Las Vegas, and Marvel Custom Solutions team up to tell the story of this acclaimed live production through an all-new, collectible comic book. KÀ #1 will debut at the Marvel booth (#2329) during Comic Con International in San Diego, July 12 – 15, 2012. KÀ fans attending Comic Con International can take home the heroic journey of Imperial Twins separated by war who encounter adventure and peril at every turn on their quest to reunite their kingdom. KÀ #1 will be distributed at Comic Con International in San Diego at the Marvel booth in July. A limited amount of books also will be available at comic book stores in select markets. In addition to the print copy of the comic book, fans will be able to access the KÀ customized comic book by utilizing Marvel’s cutting-edge digital comics reader. Fans can get an inside look at the making of the comic book by visiting www.kacomicbook.com. Featuring sneak peeks and behind-the-scenes information, including line art, storyboards and more, this site will serve as a hub for details on the collaboration. Fans will be able to receive information on how to get their own copy of the comic book. On Twitter, fans can tweet about the collaboration to @Cirque and @Marvel using the #KAComicBook hashtag. JUNE 8, MILWAUKIE, OR—Acclaimed filmmaker Guillermo del Toro and novelist Chuck Hogan bring their New York Times best-selling series of novels, the Strain Trilogy, to Dark Horse Comics with an ongoing adventure that takes a terrifying spin on the vampire genre. Renowned comics creator David Lapham (Stray Bullets, Silverfish) and artist Mike Huddleston (The Coffin, Butcher Baker) join forces in this comic book adaptation unlike any other—bringing del Toro and Hogan’s vision to life in a story that casts a deadly plague over the whole of humanity. 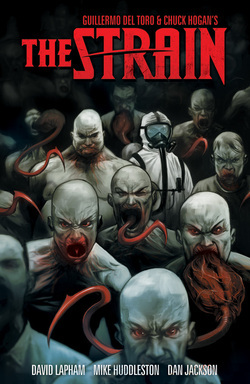 The Strain Volume 1, collecting issues #1–#6 of this ongoing series, is a horror story unlike any other. When a Boeing 777 lands at JFK International Airport and goes dark on the runway, the Centers for Disease Control, fearing a terrorist attack, calls in Dr. Ephraim Goodweather and his team of expert biological-threat first responders. Only an elderly pawnbroker from Spanish Harlem suspects a darker purpose behind the event—an ancient threat intent on covering mankind in darkness. The Strain Volume 1 is on sale November 14 in comic shops everywhere.